The many trails of the New River State Park will meander from the river’s edge to the top of the rolling hills of North Carolina’s High Country. To the left under 'Park Maps and Brochures' you will find maps for all of the trails at each of the three main accesses of the New River: Wagoner Access Road, Highway 221, and Alleghany. 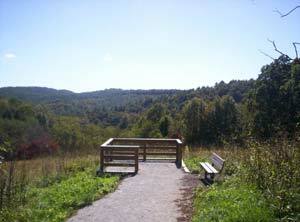 This moderate one mile trail begins on the east side of the park and traverses along side of the ridge above the river. The view is mostly of the contours of the land. This trail crosses the road and follows through a forest of Montane Oak, Hickory, Mountain Laurel and Rhododendron. It connects to the Campground Spur Trail. To get your TRACK Trail adventures, please visit the trailhead kiosk located just outside the entrance of the Park’s Visitor Center. 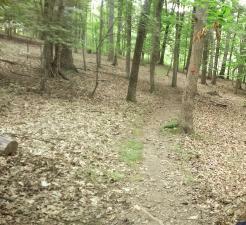 The New River State Park TRACK Trail was superimposed upon the Park’s Hickory Trail. The trail begins on the side of the visitor center (left side if facing the front); intersects with the Campground Spur Trail and continues as a 1.0-mile long loop trail that has a short out-and-back spur that will deliver you to the edge of the New River. 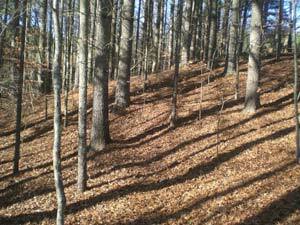 The trail passes through an oak-hickory montane forest, down to the river’s edge, up through a mountain meadow and back to the visitor center through a pine thicket. To get your TRACK Trail adventures, please visit the trailhead kiosk located just outside the entrance of the Park’s Visitor Center. The trail winds through the forest down the mountainside, past an old home site, and finishes on a grassy path by the river’s edge which leads you to river access. Branches off the Hickory Trail and winds through the forest behind the Visitor Center and connects to the Drive-to Campground.